The solution I accepted for an earlier question How to get Google's logo as a startup tile? no longer appears to work. I'm not seeing the "pin to start" option offered even after deleting IE history and restarting. In fact a comment suggests Google has removed this "pin to start" option. Is this the case? If so, why, and is there a way to get the simple blue Google square on my start screen? For me personally that used to be a simple mental shorthand for "fire up Internet Explorer, but with Google as my homepage". 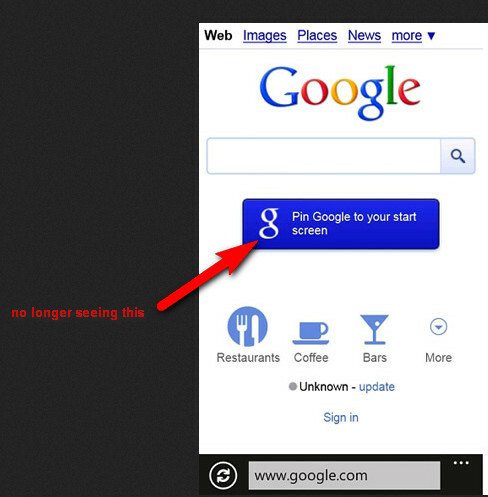 The Google standalone app doesn't do this and is actually an inferior experience to using Google within IE. The IE tile itself would be fine, except its tile (in its "theme" colour) doesn't stand out like the old Google blue. What you can do is use an app that allows you to create a custom tile for any particular action, including opening a website. One example would be MegaTile, which lets you set a tile to a website. MegaTile is by far not the only app that allows you to do this, but I have used it before to do similar things (to create a custom tile with the Google+ logo to launch the mobile site, for instance). According to Pankaj, Google did remove the "Pin to start" link on their homepage since they submitted their updated Google search app. You can also set bookmarks to any website as a pinned tile to your start screen, regardless of the website's direct support.You can also set bookmarks to any website as a pinned tile to your start screen, regardless of the website's direct support. I'd suggest you try the new (March 2012) Google App for Windows Phone. It includes Autocomplete, My Location, and Voice Search. I think Google were just doing a little clever page styling when you clicked their button so that when the Windows Phone took the snapshot of the page for the tile it grabbed just the top left rectangle that gave the appearance of a regular WP pinned app tile. I stumbled on the following link today (pinned sites for Windows 8) and was hoping the same meta tag approach might apply for WP but sadly it doesn't seem to work. Not the answer you're looking for? Browse other questions tagged internet-explorer google pin-to-start or ask your own question. Pin IMAP account to Start page? How to pin the battery saver to the start menu?